The Prime Minister is the leader of the victorious party. No term limits are imposed on the office. The Prime Minister of India, is the chief of government, chief advisor to the President of India, head of the Council of Ministers and the leader of the majority party in parliament. The Prime Minister leads the executive branch of the Government of India. The Prime Minister appoints the Council of Ministers, distributes portfolios among them, acts as the link between the Council of Ministers and the President and is the chief spokesperson of India's foreign policy. 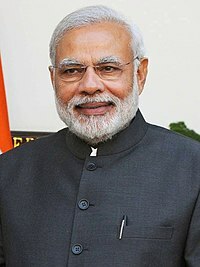 The current prime minister is Narendra Modi. He was sworn in on 26 May 2014. The Prime Minister is responsible in aiding the President in his/her work relating to the government. The Prime Minister, in consultation with the Cabinet, schedules and attends the sessions of the Houses of Parliament and is required to answer the question from the Members of Parliament. The Prime Minister also represents the country in various international meetings, conferences and organizations. should be a member of the Lok Sabha or Rajya Sabha. If a person elected prime minister is neither a member of the Lok Sabha nor Rajya Sabha, then he must become a member of the Lok Sabha or Rajya Sabha within six months. of above 25 years of age (in the case of a seat in the Lok Sabha) or above 30 years of age (in the case of a seat in the Rajya Sabha). I, <name>, do swear in the name of God/solemnly affirm that I will bear true faith and allegiance to the Constitution of India as by law established, that I will uphold the sovereignty and integrity of India, that I will faithfully and conscientiously discharge my duties as prime minister for the Union and that I will do right to all manner of people in accordance with the Constitution and the law, without fear or favour, affection or ill-will. I, <name>, do swear in the name of God/solemnly affirm that I will not directly or indirectly communicate or reveal to any person or persons any matter which shall be brought under my consideration or shall become known to me as Prime Minister for the Union except as may be required for the due discharge of my duties as such Minister. ↑ "Pay & Allowances of the Prime Minister" (PDF). pmindia.nic.in/. Retrieved 14 June 2013. This page was last changed on 15 March 2019, at 16:05.